In a recent poll held on Twitter, everyone showed the most interest (by a very slight margin) in pitching command coupled with pitch movement. I’m pleased in the interest in this very intriguing aspect of pitching command and am excited to share some insights on the effects of movement and pitching command. There are many different variables that give a pitch its unique qualities. 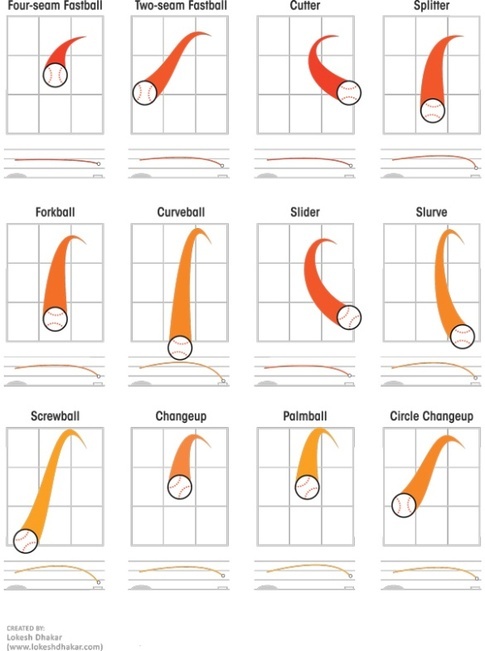 Some of the variables referenced that define or describe any singular pitch may include velocity, spin rate, horizontal and vertical break (direction of movement), depth (break-point), to name a few. All of these things can help us determine the quality or standard of a given THROW, not necessarily a ‘pitch’. ‘Pitch’ quality will always be highly dependent on the final destination of the throw, location. Executing pitches at the highest possible rate we can is what we are striving for the most. Being excellent at precision and holding to high standards of location. The difference between games and practice is that we typically have more visually tangible targets in practice than the game. Many times in competition, targets or goals may be assumed by the catcher, or the pitcher. The intent of location is not always accounted for by anyone other than the pitchers mind itself. Hence pitcher and catcher being on ‘same page’. In this blog, we want to have a better idea how to execute and locate a pitch with movement to targeted locations. Movement comes in all shapes and sizes. It may certainly be unique to everyone, and therefore needs to be analyzed greatly by the person who is applying the pitch movement itself, the pitcher. Pitches that may possess movement are essentially all pitch types but that does not mean that all pitch types MUST move. To clarify, all pitches are ‘moving’ toward the target, we are essentially discussing the vertical and horizontal break once the pitch leaves the hand en route to its destination. How do we control that? How do we command that? Pitch movement is something that we need to be able to visually see. Many pitchers will say that it’s particularly hard to see their own movement while pitching a baseball, which resonates with me as well. It’s difficult to see your own movement at times. A catchers feedback proves vital here, however ample repetition helps create a better visual of what your pitch is actually doing, which allows your brain to feedback valuable information to make adjustments to future pitches, which requires heightened awareness and intent of goals. If your pitches have a ton of movement, many times we may resort to ‘focal points’ which is an entire chapter in my E-Guide on pitching command. Focal points essentially guide where our targeted ‘release’ will be, which accounts for the movement our pitch will produce. For instance, as a lefty, facing a lefty, in order to get a chase on my slider, I would hone in on the inside corner at the belt in order to have the pitch sweep down and away off the plate for a chase. Granted I understood through time the ample movement I had on my slider. If my slider only broke 6 inches I may have needed to hone in on the outer 3rd of the plate to get a chase. Accounting for movement allows for different starting points, which affect release points that may change miniscule in nature on any given pitch. Another example would be facing a righty for myself (a lefty). I pitched inside a lot (even at 83-86). My fastball moved a good amount. With the catcher set up to receive on the inside corner to a righty, I mainly honed in on the hitters belt buckle allowing for ball to run / tail / fade / sink, what have your, back to the corner. I had a heightened understanding of my movement and accounted for it. You should too. Perhaps the most important piece of the puzzle for anyone here is understanding the consistency of their movement, and being able to adjust as necessary. Similarly to velocity, if you are moving at max effort with insane movement, don’t understand your movement, aren’t consistent with your movement, and don’t already possess command, you will not achieve it at max effort or intensity. General movement, can be created even at slower velocities. Understanding what is happening as we amp up intensity is vital to truly commanding it at a high level. Slowing down your motion to get a better understanding of your own bodily movements, followed by accounting for pitch movement will help you process your journey to commanding your pitches that have more movement, this goes for your off-speed as well.